While Florida State University awarded me a master’s degree in accounting, I earned a “doctorate degree in life” as an Amway distributor for three years. One key lesson I learned as an Amway distributor makes all the difference between success and failure in the subscriptions business. While I was shopping in Dillard’s about a month after graduation from FSU, some guy stopped me and asked, “Where do I know you from?” I had no idea. I didn’t recognize him, but I tried to think and make a few suggestions. He told me his name was Steve and that he owned an international import/export business in town. After a few minutes of small talk, he asked if I was ever open to “opportunities,” as things often come up in his business. I told him, “Sure” and gave him my phone number. Two days later, Steve called me and we met at a local restaurant to discuss “opportunities.” He showed me the Amway Plan with the circles, and I joined. Soon enough, I was cold prospecting at the mall and everywhere else. I was meeting people, following up, showing them the Amway Plan, and sometimes signing up a new distributor. All of this was hard for me. As an introverted person, I was attracted to the accounting profession because I loved working with numbers and spreadsheets a lot more than talking to strangers. But, I did it anyway. I wanted to be free from my job and have a modest level of success. Wow, did we celebrate getting a new distributor! There was so much anxiety, work, and care that went into getting each new one. And I only needed to get six distributors to go Direct for me to reach the Diamond level! Each new distributor could be the next Direct Distributor in my downline. When someone finally said yes and joined, it was a joyous occasion. But, I quickly discovered the celebration needed to be kept short because that’s when the work really began. I had to immediately help that new distributor make money. Not everyone was willing to do the work I was willing to do. (Turns out, most people aren’t comfortable meeting strangers in shopping malls.) It takes a lot of determination to meet strangers, call them on the phone, and learn how to show the Amway Plan in a way that makes someone want to join. Distributors who did nothing were worthless to me. They were great people but didn’t get me any closer to my goals unless I helped them become successful. While the economics of being an Amway distributor didn’t work out, the lessons I learned have lasted a lifetime. Although it feels like it is a lot of work, it’s relatively easy to get a new customer. But it’s all for nothing unless you do the work necessary to increase their value after they join. Five years later, I learned the same lesson within the membership. In 1999, after picking up a copy of Dan Kennedy’s book, How to Write a Salesletter, I started writing sales letters to sell membership for my association clients. And after several months of practice and study, I got good at it. New members started joining. But soon, I discovered the same lesson. It didn’t matter how many new members I generated; if those members didn’t renew, I hadn’t accomplished anything. Recruiting new members with low retention is just a big waste of time and effort. Instead, I established the first membership renewal as our team goal. It wasn’t until a member renewed their membership the first time that we celebrated. This incentivized all of us to create a great new member experience, get the new member engaged in their benefits, and nurture the relationship so that paying their renewal was a no-brainer for them. Too many subscription and membership programs are making the same mistake. They’ve become Membership Marketers rather than Member Leaders. They are experts on getting new members, but they lose them within a few months. It’s like the 24-year-old who is so busy going on first dates he doesn’t have time to follow up to get a second date. He spends a lot of time and energy for nothing. Hyperactivity is masquerading as productivity. Instead, you have to “Move the Finish Line.” Instead of thinking of “new members” as a Key Performance Indicator (KPI), set Lifetime Member Value and Monthly Recurring Revenue goals. Everything changes when you Move the Finish Line. 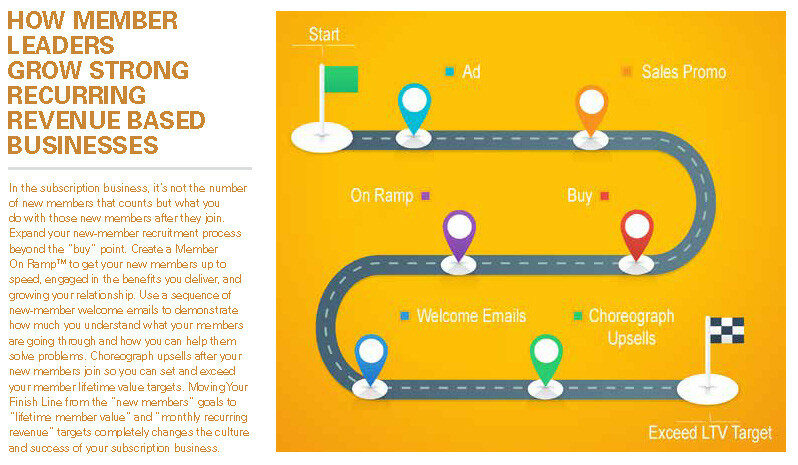 Rather than celebrating new members, focus instead on increasing the value of each new member with renewals and upsells. This focuses you and your team on fostering long-term relationships rather than on getting a new member and immediately moving on to get the next new member. This only devolves your member relationships into a series of one-night-stands. If you know anyone who has a problem holding onto their new members, or if you have this problem, my new book, Retention Point: The Single Biggest Secret to Membership and Subscription Growth, reveals exactly what to do after your member joins to build a relationship and maximize your recurring revenue. Pick it up wherever you buy books.